Win the battles. Win the war. What is RosterWatch PRO? 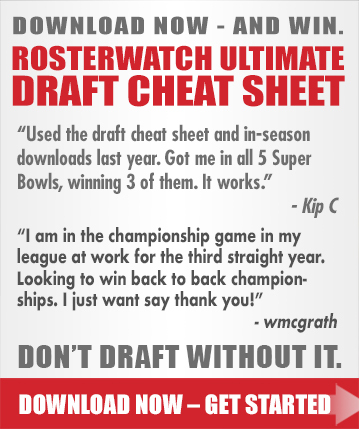 ULTIMATE DRAFT CHEAT SHEETS (Standard, PPR, 2QB, Auction- Updated Weekly) - Drafting Made Easy, the DCS is intuitive - no preparation is needed - and expert results are guaranteed. RosterWatch PRO Podcast - Exclusive NFL player performance news, fantasy advice and insight throughout the season (and preseason!). HyperDFS Professional Lineup Generator for DraftKings and FanDuel - CHANGE YOUR GAME!! For players new to DFS who want to win more money faster, or for seasoned DFS players looking to save time and generate numerous optimized lineups - we have changed the game with HyperDFS. Our users love it: "Blown Away," "Fun to use," "Addictive!" Waiver Wire Cheat Sheet - Designed so that every week our PRO subscribers can make the same waiver claims and free agent budget bids we make in our own leagues. Matchup Tool - Provides Player matchup indicators far superior to the matchup ratings provided by yahoo, espn, etc. Every matchup of the week one one simple and sort-able page. Vegas lines included. Touchdown Dependency - Find out which players in fantasy are most dependent on unpredictable and unreliable touchdown scoring for their fantasy production, weekly throughout the season. These are great players to sell high on. RW Expert Advice: As a PRO subscriber, we encourage you to join our lively community in the comments section of front-page articles. We personally answer fantasy questions in the comment threads, year-round. Already a RosterWatch insider? Please buy using the email address you subscribed with! Or better yet, log in before going PRO!